Landtasia Organic Farms Pty Ltd (Landtasia) was founded in 2001 to establish and operate an exemplary organic mixed agricultural enterprise. Since its founding, the company’s committed team has been laying down the structural foundations of the property that will allow it to realise its objective of exemplary organics. During that time, we’ve transitioned from conventional agriculture and improved over 5,600 acres of pasture lands and meadows to organic. These larders now sustain our livestock. Soils were reinvigorated, permanent grasses planted, water management strategies put in place and over 30 kilometres of new fencing were also installed. In addition to our work on the grasslands, we are also establishing an apple orchard and a vineyard. Our apple varieties are Pink Lady, Golden Delicious, Jonathon, and Granny Smith. Our cool climate grape varieties are Pinot Noir, Shiraz, Chardonnay, and Viognier. In Spring 2007, we commenced the establishment of a permanent organic honeybee colonies. The primary objectives of the colony are: 1) bio-security, 2) pollination, 3) organic pioneer colonies and 4) organic honey production. We will be releasing the pure organic honey for sale commencing Summer 2010, with some preview samplings by Spring 2009. Rounding out our current food production capabilities are our potato cultivations. Our 2009 potato harvest included three delicious varieties – Coliban, Kennebec, and Sequoia. This range provides beautiful potatoes suitable for baking, mashing, salads and deep frying. There is a lot of concern these days about climate change; not more so than here at this farm. We are none the wiser as to what is in store for us than the next person, but we are taking steps every day to put our best foot forward, so to speak, so that come what may, Landtasia is well positioned to flow with the changes while continuing to produce nourishing food for its customers. The practical side of organic agriculture recognises that Nature has a role to play in healthy farming. In fact it has the starring role with the farmers being just the stage hands. This recognition of the genuine role between man and Nature shows up throughout our work at Landtasia. We cross breed our Angus stud herd to develop stronger constitutions and natural immunities through hybrid vigour. This eliminates the need to give them prophylactic pharmaceuticals. You can hear it in the buzzing of the native and honey bees across the property who have plenty of flowering plants to sustain their pollination performance of abundance. And you can look to our skies and see each spring more small birds, butterflies and lady beetles flying than the year before thanks to the absence of herbicides and pesticides in the environment. An environmental centrepiece at the property is the Landtasia Wetland Park Sanctuary. We started this development in 1996 to remediate a large erosion gully and to arrest a eight metre wide head-cut that was making its way up the valley. While drought had slowed its evolution several times this past decade, it has not been able to suppress its natural ability to heal. Amphibian life abounds in its waters and, after the completion of a fox-proof perimeter fence, we are certain to see an explosion of small specie birds. As organic farmers we are eager for more small birds to join the work force of insect control. While the property is primarily an organic beef ranch, as its carrying capacity naturally rises, we will be extending its meat operations in the near future to include other healthy organic protein rich meats including lamb, goat and eggs either through our own husbandry or through our local organic neighbours and network of certified natural growers. Management believes that organic foods, especially our Landtasia Certified Organic Beef, provide healthy benefits to consumers who want certainty in how their food was bred, raised and prepared for their table. 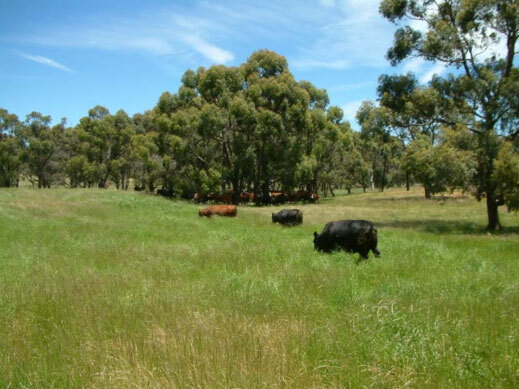 At Landtasia we raise and care for our livestock humanely on chemical-free grasslands. Our cattle are not given weight and muscle gaining hormones, stimulants or antibiotics, nor any genetically modified feed. We recognise our customers' desires for natural, healthy, and affordable quality red meat from a farm source they can visit, know and trust and can confidently serve to family and friends. This is our goal too. The farm raises and markets its produce locally in the Australian Capital Territory - New South Wales region.